Our next feature is a letter from Winston-Salem Prep LAT, Dontonio Garrison. 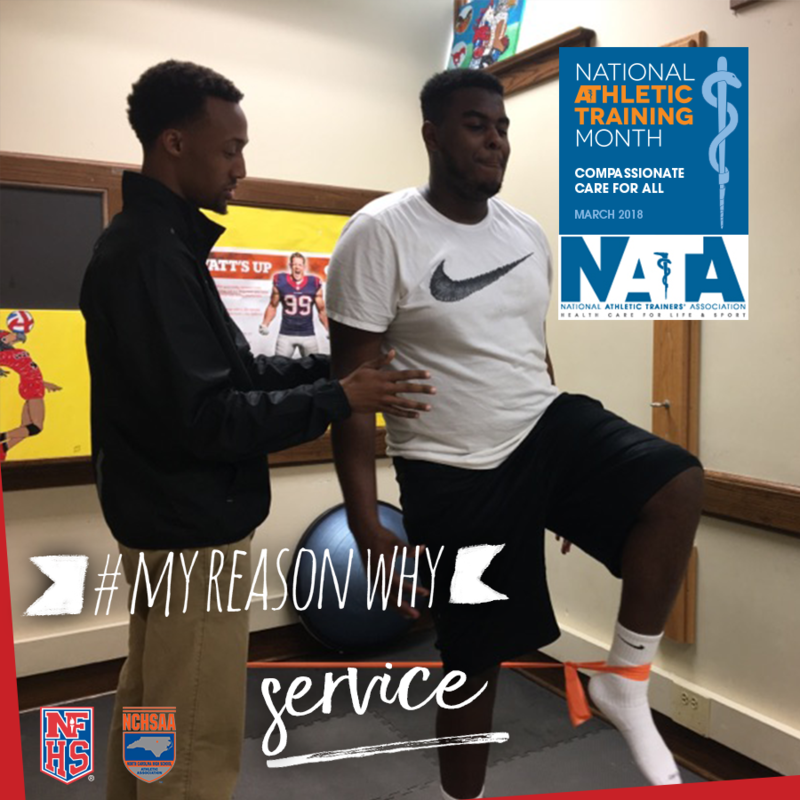 He describes his reason for joining the Licensed Athletic Trainer profession at the high school level - Service. My reason why I chose to be an athletic trainer at a secondary school is not a straightforward answer. I believe it choose me more than anything. I have learned that the best things in life will not come unless we go to places we never intended to go. The secondary school system has molded me and continues to help me grow into the health professional I am looking to be. Athletic trainers work alongside other health professionals to keep the children, as well as spectators, safe. We play a role in serving the community through our knowledge of different topics and we serve as a defender between our athletes and the field. The personal and professional fulfillment I have received, is waking up every day with an open mind and heart to not only serve but learn. There is a joy about walking into your school and being greeted by faculty and athletes. Of course the daily paperwork and phone calls are not fun, but the relationship we have with every athlete is powerful. Through every evaluation, treatment and rehabilitation, there is an increase of comfort and hope towards our athletes. Athletic training is a demanding and challenging field. Although I am a newly licensed athletic trainer I have received joy from seeing my athletes grow in different aspects. My athletes appreciate all that I do for them, but they do not realize the impact they have on my own life. When we allow our lives to get molded by the experience and not by a book, we are more likely to have the most success. Every decision through our practice may not be the desired decision in the athlete’s eyes, but it is the safest decision. Parents may not completely understand your role as an athletic trainer unless we connect with them on a deeper level and educate. I don’t believe in just walking by an athlete and his parents after a practice or game. Athletic trainers should want to let parents know who they are and what they stand for as a professional. My athletes’ parents appreciate the phone conversations on their child’s injury or the personal conversations before and after activities. When we take the time to appreciate the community, then the community will appreciate us. If you are a secondary athletic trainer, then it is important to focus on the reasons we serve. I believe there are three enemies that get in the way of our servant hood: pride, who won’t we serve and how do I treat people who serve me. Those factors will bring up a test of servanthood that will shape us as a profession. Will I serve? How will I respond? I am simply stating to continue to show our worth as a health professional through our knowledge and diligent work. We serve as a teacher and mentor towards the young minds we see daily.